I went to the unveiling of the new, “improved” Museum station yesterday (2008.04.08). (See my photos and the official photos.) I spent a whole week trying decide whether it was worth it or not. I stayed away from the last TTC meeting, where a vote to destroy its type and tile heritage was a fait accompli, so that I wouldn’t have an aneurysm or resort to a full-on Pacino re-enactment (“No, you’re out of order! You’re all out of order!”). Diamond & Schmitt Architects, the mayor and Jill Arthur, and Jeviso Construction are also listed, but I dispute that they are actual donors. I was exhausted when I took the midnight tour and I was quite disgusted by the half-assed placards. I decided to bail on the unveiling. But I woke up the next morning and instantly decided the opposite. Now, what to wear? I planned to get myself on TV as much as possible, after all. I arrived at 1045 hours, said hello to the usual suspects, and hunted for press. I did some print and radio interviews and a single standup for TV – Global, as it turned out. I handed out my flyer, whose phrasing was elaborately even-handed. I went out of my way not to use the phrase “grande dame of the ROM,” for example. Tess Kalinowski from the Star was there, and almost completely concealed her annoyance that I was standing right behind her. She wasn’t covering it, she told me. They’d run a whole page on Sunday and I was in it, she also told me. Then why are you here, I asked her? Background? She gave a noncommittal answer. I had a long talk with a skeptical Royson James of the Star . I later looked Morrison up and explained that I had been writing letters to TCF about this project since about 2006, but at no time whatsoever did I receive a response (save for one acknowledgement E-mail), let alone any kind of dialogue. TCF acted as though they had all the money and approvals they needed, so the project was going full steam ahead and critics didn’t matter. TCF carried out public relations as though this were the mid-1970s – by issuing press released to be retyped by compliant newspaper hacks. As a result, I told her, TCF ceded the entire online sphere to its critics. Our writing and our pictures are the first thing you find in a Web search, and that isn’t going to change in the foreseeable future. By treating me as beneath acknowledgement, TCF created a vacuum I went right ahead and filled. She told me she’d pass that on to Rahul – who will go right ahead and ignore it, I snapped. Also, I told her, had TCF bothered to talk to me, the endless mistakes in typography could have been avoided. This presumes that Jack Diamond (present at the unveiling, but unwilling to identify himself to strangers) would bother listening to the peons, but project managers would have at least known up front that they were screwing up the type. It is now screwed up and is going to stay that way. Does he still think Toronto public space is a miasma? Yes. He thinks stations near landmarks could be upgraded after the manner of Museum. I asked him a couple of different ways what he thought of the TTC’s plans to destroy its heritage, especially on the Bloor line. Eventually he admitted he doesn’t know that their plans are, but some stations are indeed beautiful and heritage should be preserved in some way. How often, in the run of a month, does he use the subway? All the time, especially when he’s coming downtown. (Hence he is one elite who does use the subway; correction noted.) The upstairs levels are to be renovated, too. Thorsell was even-handed and level in his responses. An old pro, nothing takes him by surprise. Now, about the press coverage. I barely made the cut anywhere. I was all set to quote the Joker and ask “Can somebody tell me what kind of world we’re living in when a man dressed up as a bat gets all of my press?” But I have to say, the piece by Zosia Bielski on the Tubby blog is the best press I’ve ever gotten. She gets full marks for simply reporting what she observed. Too bad she got one rather important fact wrong. Mr. Clark complained the new Museum signage – large and decorated with hieroglyphs – is spaced too tightly, and that smaller versions cannot be seen from the traincar window because they are set too low on the walls. Mr. Clark pointed to the “legions of transit fans in Toronto and around the world” who loved the TTC’s unique typeface and tile heritage, now set to disappear as 63 of the system’s 69 stations prepare for a makeover as part of a $275-million station modernization program. I would later put the same observational/reporting skills to work when I got bounced from the reception at Jamie Kennedy’s restaurant. I simply reported what happened. How embarrassing, though not for me. There seems to be no end to TCF’s refusal to talk to its critics. TTC signs have threatened to take over my life in the last year and a half. Quite a few people disagree with me, but nobody disputes my scholarship and knowledge of the topic. But that isn’t enough. It doesn’t pay the bills, and, much more importantly, I have no victories whatsoever to show for my effort – unless you count persuading the TTC not to pull down and throw out the old Paul Arthur vestiges at St. George, which I don’t. I proved that, when dealing with the TTC, the more absurd, expensive, and cockamamie a scheme is (viz TCF’s), the more likely they are to sign on the bottom line. 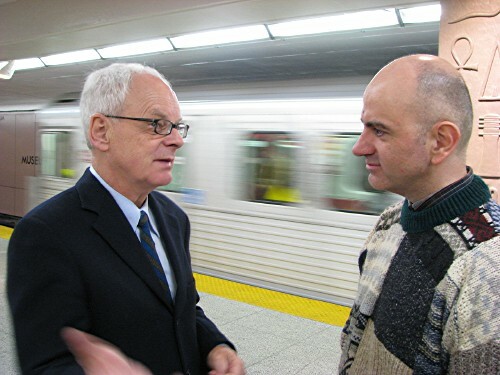 But when presented with an avalanche of facts and evidence, much of it culled from its own documents, TTC acts peevish, defensive and arrogant and does the exact opposite. I was told by one person that the following isn’t true, but it remains true for everyone but him: The only people who love the look of the subway don’t work for the TTC. A great deal of unpaid effort and a stress led to no results whatsoever. In the argot of the moment, my work on TTC signs HAS FAIL. As of today, I have pretty much given up.